I love workshopping with couples, trying to figure out the best shots, the best angles and the most ideal moments to capture during the ceremony and reception. Yet when a couple like Sunny and Gina comes along that knows exactly what they want for their wedding day, and have every detail planned out, it’s a wonderful thing. While Sunny and Gina wanted their family at the wedding, they knew that they didn’t want the stress and debt that goes along with planning a large wedding. Instead, they planned the most beautiful, intimate ceremony and reception in Philadelphia with just 20 of their close family members present. It was exactly what they wanted, and the day could not have been more perfect. Even the story of how Sunny and Gina met is perfect. Sunny is the founder of a company called Tiny Docs, which creates cartoons that teach kids about their health in a fun, relatable, easy-to-understand way. Sunny was visiting first grade classes to give a presentation to the kids and Gina was teaching one of those classes. When Sunny left that day, he called his brother and told him all about the beautiful teacher he met that day. After a year had passed (yes, a year! ), Sunny asked Gina out on a date… and she declined. Many times. However, when Gina eventually agreed to go on a date with Sunny, she did not want the night to end! She knew after the third date that she wanted to marry him. 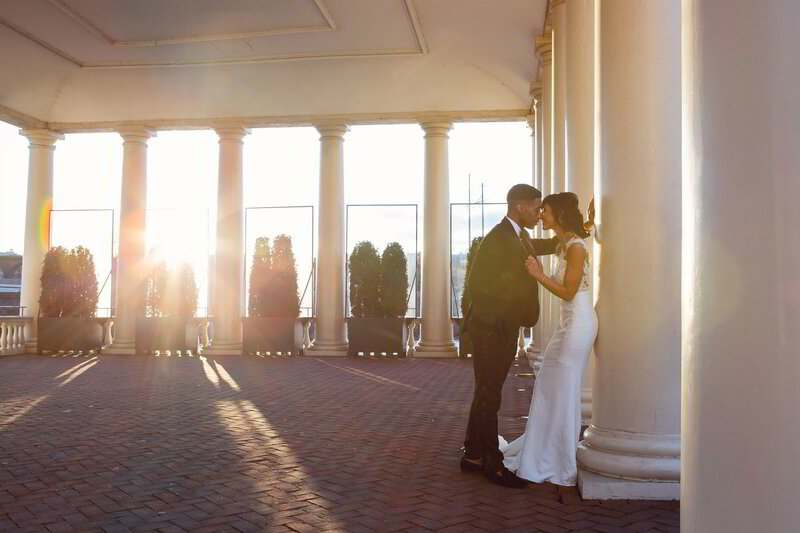 Their engagement was quick - Gina knew that she wanted her 92-year-old grandmother to be there to see her and Sunny say, “I do.” They picked a downtown Philadelphia wedding venue that was easily accessible and close to her home, but a few days before the wedding, Gina found out that her grandmother was too sick to attend. Gina drove to her grandmother’s house at 6:30 a.m. on the day of their wedding and put on her dress, veil, and shoes for her to see. It made her grandmother’s day, and this made Gina so happy. I met up with Gina later that day at an Airbnb near Center City, Philadelphia, close to the wedding venue. Gina could not stop smiling. She was so ready to marry Sunny, and so excited for the small wedding she envisioned, that she could not stop smiling throughout the entire day - making my job even easier! Sunny, too, was incredibly excited, and I loved seeing the excitement and happiness in both their faces all day long. We walked to Vaux Studio Wedding Chapel and Event Space, a small chapel in Philly, and as anyone living in the city knows, it’s impossible to not cheer, honk, and celebrate in every way possible when a bride and groom are walking down the street! As expected, the ceremony was beautiful. The small chapel provided the ideal backdrop for the intimate wedding. The light coming through the windows was amazing! Gina’s wedding party consisted of a three-year-old ring bearer, a five-year-old flower girl, and an eight-year-old bridesmaid. The best man was the groom's brother, Damon Erik Williams, an actor from Los Angeles currently starring on the show Animal Kingdom (!!!). The bride’s best friend officiated the wedding - it was a perfect ceremony! Now remember, I love winter weddings, but I’m generally bundled up and very prepared for the temperatures. 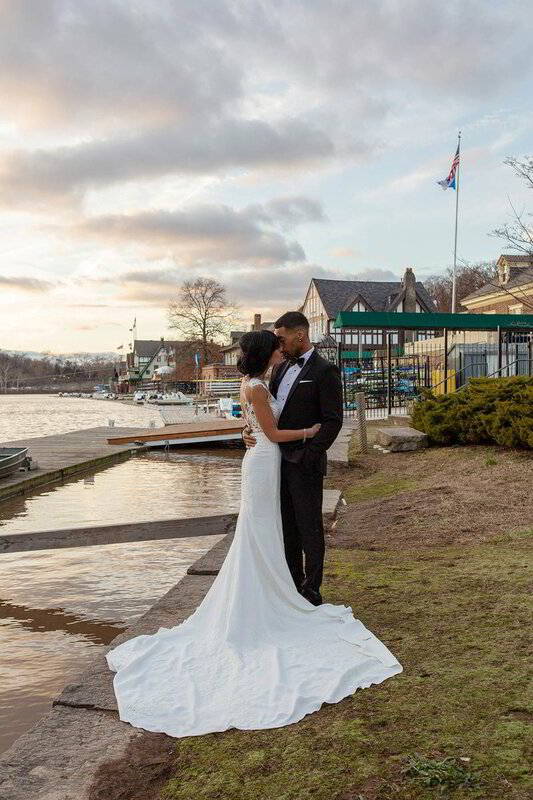 As any bride would, Gina wanted photos in her beautiful wedding dress with her new husband by the Philadelphia Museum of Art and Fairmount Water Works… in December. She was freezing! But she was such a trooper, and I’m so glad that she braved the frigid temperatures, because being in this beautiful spot at sunset made for some absolutely incredible photos of the new husband and wife. "Damon was patient, talented, and caught some beautiful and organic moments. Sunny and I are so grateful for our beautiful photos!" Gina’s grandmother passed away six days after their wedding. When we were taking photos earlier on the day of their wedding, Gina was deciding on whether or not to wear her grandmother’s bracelet. I encouraged her to do so, as it would represent such an important part of her family, and I’m so glad that I did - while Gina was going through her grandmother’s personal belongings, she learned that it was a wedding gift given to her grandmother by Gina’s grandfather on their wedding day! Even though Gina’s grandmother could not physically be there on their special day, she was there all along, and the bracelet made an appearance in almost every photo of Gina. What an awesome story! "...The bracelet my grandmother let me borrow was a wedding gift given to her by my grandfather." Winter weddings in Philly, especially the small and intimate kind, are unforgettable, and I absolutely loved working with Sunny and Gina. They had learned about my wedding photography services online after reading “wonderful reviews” from past brides and grooms, and I’m so happy that they reached out. Congratulations, Sunny and Gina!